New Delhi: The world has gone digital and so has the news. With over 100 crore mobile users in India, the era of digital journalism is here. However with the dissemination of news becoming easier, the competition in the field has also increased exponentially. It is therefore not less than a remarkable feat that among all print and TV media having their dedicated news portals, Ten News being a stand-alone digital media had created a niche of its own. By repeatedly covering the news that many ignore, raising the issue that effect the common man and being a bridge to spread cultural diversity of the nation through elaborate coverage of events and cultural functions, we have created a loyal base of viewers. Two of our top video have been watched by over one and half million people. The combined viewership of our top 5 videos alone is about 60 lakh eyeballs. Our exponentially growing base of audience is one of the prime reasons that keeps our team motivated to work. Be it the humid hid or fogy winter mornings, the TenNews team strives hard to bring you the fastest, most detailed and completely unbiased news from different parts of Delhi/NCR. We have been able to win the trust of people because not only reading the news online saves a lot of time; it also keeps you regularly updated about the days happenings. When you talk about India there are 100s of different news channels in dozens of different languages. However, Ten News had a name of itself in the digital news section. The changing preference of people now is to gain news quicker and whenever and wherever they want. Mobile provides them with a fantastic platform to be able to do that. That is what is carrying the huge shift towards Digital. Online news portals have become a mainstream source of news. In an era of thousand news feeds it is difficult to point out good sources per se. Ten News has emerged one of the reliable and unbiased source of political , business , technology , entertainment , city news in India. Providing updates faster, Tennews.in is the one-stop solution for getting regular feeds on time. Ten News recently added another feather to its cap with Ten News YouTube Channel becoming one of the most followed and subscribed news channel in 2018. Currently with 78K plus subscribers, we regularly reach to diversified sections of society with our fast updates. 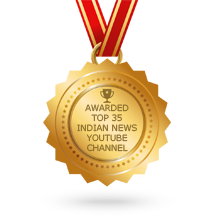 According to most comprehensive list of best Indian News Youtube Channels on the internet by //blog.feedspot.com, Ten News is Ranked 27th leaving far behind the likes of The Economic Times, Mirror Now, Outlook Magazine, DNAIndiaNews and Business Standard. The Youtube Channels were ranked based on Total numbers of subscribers, video views, video uploads, Quality and consistency of videos and also Youtube search ranking. With the Independent and outstanding team, Ten News believe in Journalism of Conscience for his followers and subscribers at first place. Ten News Network’s 4 news portals , social media channels, the YouTube News Channel , whatsapp groups and broadcasts channels show quality journalism, reporting and trustworthy news. If you are any of your friends have still not subscribed our you tube channel, you can do it now to stay updated with the news around you. You create history, we write it online!